Check the inn to see if anyone's seen anything suspicious. Both you and your opponent start with Broken Bottles in play. Liquid Courage Lane: When a creature takes damage here, give it +2/+0. 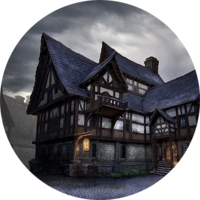 The Cloudy Dregs Inn is a location in the Wayrest map of The Fall of the Dark Brotherhood campaign. It is one of the first two locations during the Enter the Shadows episode, along with the Murder Scene. Uther sends you to the inn to see if anyone's seen anything suspicious. However, the barman doesn't take kindly to you and drags you into a bar fight. Barman: You ask too many questions. I think it's time we taught you what we do to nosy people. A barfight has broken out. Watch out for broken bottles! Barman: All right, you win. There's a man who says 'Hail Sithis' when he's in his cups. He scared me more than you do - but not anymore. He lives on the East side of town. 1x Daggers in the Dark Action 0 – – 1 Common Equip a Steel Dagger to a random friendly creature in each lane. 3x Firebolt Action 1 – – 1 Common Deal 2 damage to a creature. 1x Crystal Tower Crafter Creature (High Elf) 2 1 1 1 Common After you play an action, Crystal Tower Crafter gains +1/+1. 2x Ice Spike Action 2 – – 1 Common Deal 2 damage to your opponent. 2x Crushing Blow Action 3 – – 1 Common Deal 3 damage. 1x Keeper of Whispers Creature (Redguard) 3 3 4 3 Epic Other friendly creatures are immune to Silence. 1x Northpoint Captain Creature (Breton) 4 4 2 2 Rare Summon: Summon a 0/4 Northpoint Herald with Guard. 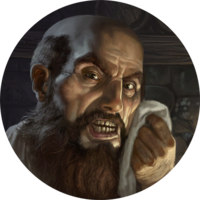 1x Winter's Grasp Action 5 – – 3 Epic Shackle all enemy creatures. 3x Wardcrafter Creature (Breton) 2 2 1 2 Rare Summon: Give a creature a Ward. 1x Haunting Spirit Creature (Spirit) 3 3 3 2 Rare Last Gasp: Give a random friendly creature +3/+3. 2x Lion Guard Strategist Creature (Breton) 4 2 3 3 Epic When you summon another creature in this lane, give it a Ward. An aggro style is difficult to pull off due to the opponent's guards in the early turns, but a control style is likely to suffer too much in the early game. As such, a midrange style is advisable for Cloudy Dregs Inn. Because of the Broken Bottles supports, it is unreasonable to bank on creatures with low health surviving. Due to the Liquid Courage Lane in conjunction with the scenario, it is a far better strategy to rely on low-power and high-health creatures, much like the A.I. itself does. Due to the high potential of the opponent's creatures to grow out of control; it is advisable to pack either on-demand Silence, Lethal creatures, or Hard Removal. If you find that the Broken Bottles support provides more advantage to your opponent rather than you, it may be advisable to destroy it with cards such as Vicious Dreugh. Do note that the example deck below is built to work with the broken bottles support. UESP has included a deck exemplar for this battle, effective in both normal and Master modes. The cards in the example deck have been chosen due to affordability and utility in the scenario. Its initial gameplan is to survive the opponent's early aggression without allowing the opponent to gain board control. Its prophecy count includes enough cards that prophecies should be expected; however it should not be counted upon. Silence effects should be held for times at which they're direly needed; they should not be the first response. Once the opponent is forced from the Liquid Courage Lane, it will move to the Shadow Lane. Without becoming too enamored of the Liquid Courage Lane, one should be ready to pivot to defending the Shadow Lane. At this stage in the game, the opponent's larger threats will be found there; be prepared to defend against this. 3 Suppress Action 0 – – 2 Rare Silence a creature. This has utility all through the game; however it is advisable only to use it when it makes it possible to immediately remove a creature or when the opponent's creatures have become too powerful. 3 Deadly Draugr Creature (Skeleton) 1 1 1 1 Common Lethal This has little to no utility in the early game, but in the middling and later stages, this card can remove some of the opponent's larger creatures. Note that one should be careful in using it early. 3 Fharun Defender Creature (Orc) 2 1 4 1 Common Prophecy, Guard This card can serve to stave off an assault in the middling stages of the game, and can be expected to proc as a prophecy occasionally. Its health means it is not vulnerable to death from broken bottles. 3 Oldgate Warden Creature (Breton) 2 0 5 1 Common Guard, Regenerate A staple in this battle; its effectiveness as demonstrated by the Surly Barkeep should be all the justification necessary. 3 Raging Horker Creature (Beast) 2 1 3 2 Rare When Raging Horker takes damage, it gains +1/+1. This card's effectiveness lies in the early game; where it effectively negates the effect of broken bottles and can grow to be a threat against the opponent. 3 Sorcerer's Negation Action 2 – – 2 Rare Silence a creature, then deal 2 damage to it. A powerful card that can serve as removal when called for; especially on targets such as Daggerfall Mage, Breton Conjurer, and Night Predator. 3 Wind Keep Spellsword Creature (Breton) 2 2 2 1 Common Ward A staple in midrange decks, Wind Keep Spellsword holds the board for the first few turns. 3 Ancestral Dead Creature (Skeleton) 3 2 4 1 Common Slay: Summon a Risen Dead. This card's stats make it effective in the broken bottles lane, and its slay ability can slow down your opponent while diluting Broken Bottles's targets. 3 Bruma Armorer Creature (Imperial) 3 2 2 2 Rare When you summon another creature, give it +0/+2. The card makes your creatures less vulnerable to broken bottles and baits out your opponent's removal. 3 East Empire Crafter Creature (Imperial) 3 2 4 1 Common When you summon another creature with 5 health or more, give it +1/+1 and Guard. The card has a high synergy with the high-health cards in the deck as well as being able to survive against broken bottles. Summon: Give a creature in your hand Guard. As a prophecy with its ability, the only role of this card is to help out in a tight spot, either as a prophecy or to play a guard in a clutch moment. Avoid giving guard to creatures you would rather exercise discretion with though, such as Deadly Draugr, East Empire Crafter, Bruma Armorer, and Little Girl. Summon: Silence another creature. An on-demand silence effect that can be used to wipe out the opponent's creatures' buffs. Additionally, Cursed Spectre is a prophecy. 3 Hatchery Meddler Creature (Dark Elf) 4 5 3 2 Rare Summon: Swap a creature's power and health. Hatchery Meddler can lend additional survivability to your creatures, because in the Liquid Courage Lane, power can quickly outweigh health. This can make creatures incredibly difficult to remove in that scenario, as the low power caused by the swap can quickly be countered by Liquid Courage. This card can also serve as removal for low-power cards like Oldgate Warden or to even out trades with higher-health and lower-power creatures. Deal 4 damage. A prophecy card that can wipe out the opponent's higher-health creatures or simply reduce face health. 3 Mystic Dragon Creature (Dragon) 4 4 4 1 Common Prophecy Back-breaking as a prophecy, and with a sufficient statline that allows it to serve defensively or offensively in the Liquid Courage lane. 3 Conjuration Scholar Creature (Redguard) 6 1 2 1 Common Summon: Summon a 5/5 Frost Atronach with Guard. Increasing the count of bodies on the board, it dilutes possibilities with Broken Bottles. The guard it summons is rather powerful, and is larger than the base form of all of the opponent's creatures. Your opponent can't target Nahagliiv with actions. Non-essential, though its high health allows it to block nearly all of the opponent's creatures, and usually multiple. It additionally has synergy with East Empire Crafter. As one of the two Legendaries, this card could most easily be swapped out. Your actions have Breakthrough. Ancano is a powerful tool, with 5 damage being more than most creatures' health as well as being a good amount to push to face. Ancano's ongoing ability also allows cards like Lightning Bolt and Sorceror's Negation to also push face even when used against creatures. Ancano's health is also sufficient to proc off East Empire Crafter. This Legendary is very powerful and is very easy to obtain, with a Skyrim theme deck containing him. This page was last modified on 5 February 2019, at 23:23.